The Walking Dead is a clear-cut hit. Fans of the comics are devoted, the show pulls in consistently high ratings and the property has spawned a universe of plenty of other forays into the dire circumstances Rick Grimes et all find themselves in on a daily basis. There's still room to explore the world even further and Image Comics is teaming up with Skybound to do just that in The Walking Dead Coloring Book, due in stores this May. This oversized adult coloring book features art from throughout the long-running series, The Walking Dead. Sure, The Walking Dead has never had color, but don’t let that stop you from coloring in all your favorite survivors and zombies! Just make sure to stock up on plenty of red. 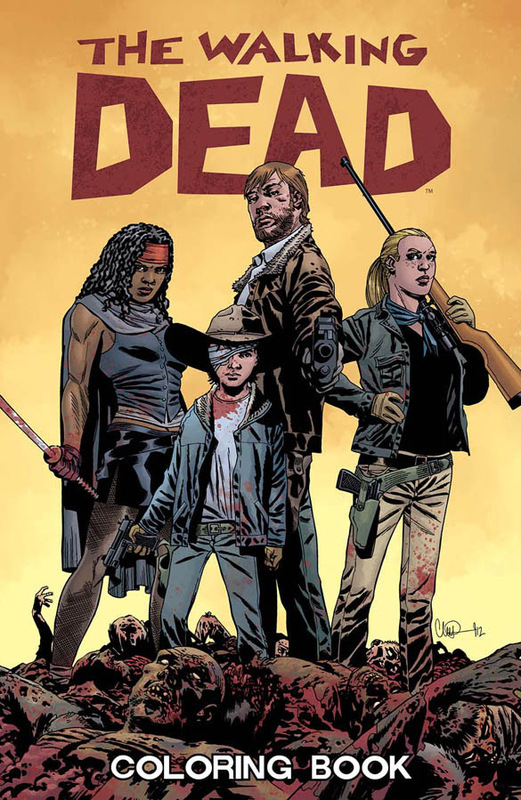 The Walking Dead Coloring Book (ISBN: 978-1-63215-774-4) hits comic book stores on Wednesday, May 4th and bookstores on Tuesday, May 10th, and will be available for $15.99. It can be ordered by retailers from Diamond Book Distributors with Diamond code FEB160615. What could be more calming than the therapeutic coloring of New York Times bestselling THE WALKING DEAD COLORING BOOK? Color in walkers, brains, and gore galore in this official 96-page coloring book set to release from Image Comics/Skybound this May. THE WALKING DEAD COLORING BOOK (ISBN: 978-1-63215-774-4) hits comic book stores on Wednesday, May 4th and bookstores on Tuesday, May 10th, and will be available for $15.99. It can be ordered by retailers from Diamond Book Distributors with Diamond code FEB160615. It can be preordered now on Amazon, Barnes & Noble, and Indiebound.